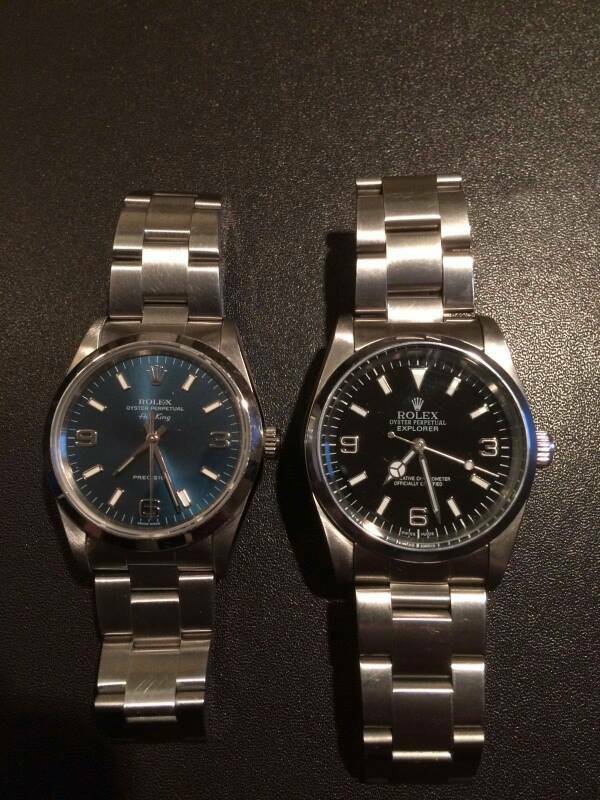 Which Rolex Explorer 14270 or 114270 or 214270??? Thread: Which Rolex Explorer 14270 or 114270 or 214270??? Really interested in purchasing one of these Role Explorer models. I do like the ideal of the 39mm case 214270 model and i love the ranges clean lines. Which do you have and how does it wear??? 214270 for me, although it doesnt seem to have been worn for a good few months, better wear it for a day or it meets the "6 months and your out" rule that I've just given myself. Currently own a 214270 and 5500 Explorer. ALL of them are awesome, the Explorer is one of my favorite watches in any guise. However, the 214270 edges it for me, better bracelet and clasp (with micro extension), better movement (silky smooth when manually winding), super accurate and decent power reserve. The 214270 being a little larger than the 14270/114270 is easier to read and really comfortable to wear. The problem with the 39mm to my eye, is the fact Rolex kept the same hand set mean they (especially the minute hand) are to short for the design… I'm also not a fan of the white gold arabics. I can't really understand why none of the versions have lume fills - why give it the look but not the function? Taking the criticisms aside, I do love the Explorer! 1. The glass on the 214270 cannot be replaced by half as many watch-makers as those on the earlier models can. This may result in a trip to your local AD and therefrom "it'll-need-a-service-at-the-same-time-or-we-can't-touch-it" world. 2. The hands are a little oddly proportioned for such a big dial as the 214270 has. Not a massively loved model, the base Explorer, these days, which is a shame. It's classic looks and pedigree mean it should win better attention. The indices don't need to have lume, as you have the triangle at 12 for orientation in the dark. 1. That is interesting to know, thanks for the information. While there's no date window for shattered crystal to migrate through to the movement, I suppose an impact strong enough to shatter the sapphire would sensibly prompt a service. For the OP - I can only say that since having a 214270, both my Sub and Speedy have been languishing in the safe. The Sub came out last week and in comparison the dial is pokey, the edges of the case are sharper, the bracelet feels rather insubstantial and the case sits high on the wrist. The Explorer is the most comfortable watch I have worn, with the easy-link expander coming in useful when your wrist expands in heat. It's small but has a large dial. It's more than waterproof enough for most needs. It's understated and not at all obvious. The lume's good and my time keeping is at +2 per day. The bracelet can be easily touched up with a garryflex if you fancy some DIY and the polished bezel, so far has not suffered anything serious. I do get that some find the up-scaling from 36mm to 39mm not to their tastes but if you do like the new aesthetics and can splash the cash, I'm sure you'll enjoy wearing it. I should also perhaps add that I tried a wide range of Explorer substitutes before deciding to purchase the 214270: a couple of cheapies off e-bay, an Alpha (too small at 36mm) Eddies' PRS-25 (excellent value - but too big for me and I didn't like the 9105 rotor noise) and MKII Vantage - didn't like the dial and the one I had was slightly modded. Less is more could be a useful motto for the Explorer. Never really bothered me but appears to bother a lot of people, not all hands on the watch need to touch the markers ... in fact it's the overhanging hands of the last generation of 1016 that bother me more. I recently faced this challenge and opted for the 114270. As far as I can tell the 114270 and 14270 look identical so the latter offered an updated movement and bracelet. For me the 214270 was too big for my wrists; but if you do have big wrists this may sit better. I concur that the 214270 needs bigger hands, but it's not like you cant accurately tell the time with them. I felt also the 36mm was more in line with the classic Explorer; I don't know why they dropped the text EXPLORER to the bottom of the 214270; I think this also changes the balance of the dial. 36mm 114270 is the best of the bunch; better proportioned than the 39mm model, almost has the look of an integrated bracelet on the wrist. 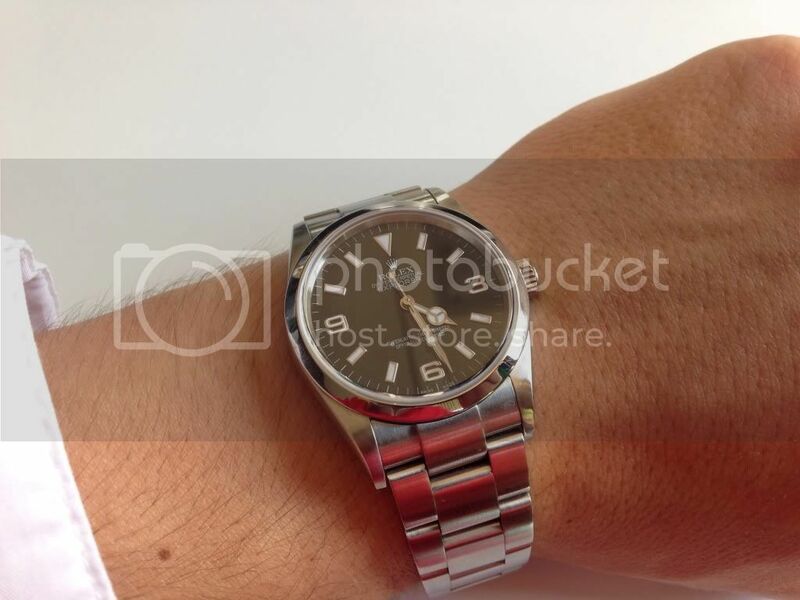 Whenever Rolex try scaling the 36mm models up something doesn`t quite work. As for the hands, they do look a bit short on the current model. !5 years ago everyone was happy with the size of the 114270.......nowadays everyone's wrists have grown! 214270 I love - Wore a friend of mine's last weekend & was most impressed. Didn't want to give it back! 214270 for me also. The hands thing I've never noticed. No contest for me, unsurprisingly... Of course it is all down to personal taste, tried 36mm, too small for my taste. Have worn my 214270 almost exclusively for 2yrs - sold practically everything else! I wrote a review back when I first received it, I think I am still in the honeymoon period!! My advice Marty - TRY the 36mm and 39mm before committing! Thanks for the advice Rob. 1016 for me. Looks the nicest of the bunch. Dont think 39mm suits this one. I think if your are going vintage then the 1016 is the only option. What I don't understand is why they fetch such high prices, having been in production for 26 years you would have thought they would be quite common. I'd worn a 1966 Seamaster for almost a year before finally settling on the 214270. Expected the jump from 34mm Omega to 39mm to be too big but surprisingly the 114270 looked too small on my wrist. That, coupled with the updated movement, bracelet and clap it was an easy choice. Not to mention there was only about £500 of a difference between brand new 39mm and pre-owned 36mm. Great watch. Never leaves my wrist. The watch for all occasions! I own three Rolex watches, a 39mm Explorer, a 16610 Sub and a 1981 Freccione Explorer 2. 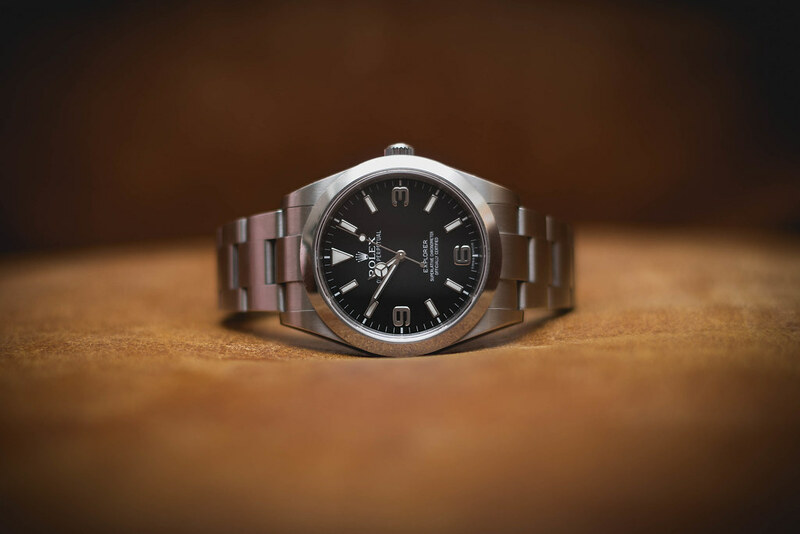 My favourite without a doubt is the 39mm Explorer. It is superbly constructed and the bracelet is really good. It is totally below the radar and no one notices it which is how I like it. You can wear it with a dinner jacker or with jeans and T shirt, it really is the universal watch. To be frank, if you have an Explorer, you do not really need any other watch. As to whether you should buy a 36mm or 39mm version, just go for the one you like the best, they are all good. 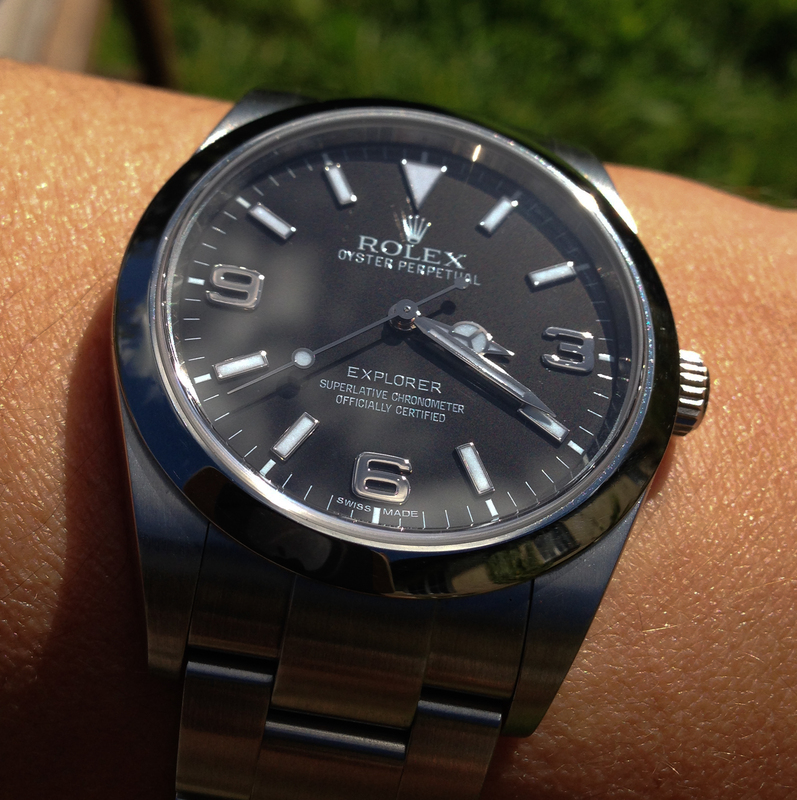 I love my 39mm Explorer its by far the most comfortable I have ever bought, its understated but very classy. Last edited by Martylaa; 8th April 2015 at 15:53. Never seen that one, quite a good read thank you. I vote 114270 coz thats the one i have. I have recently acquired the 214270 and love it. Rarely leaves my wrist. I wear watches 24/7 and find the shorter hour hand much easier to read in the dark. My eyesight is terrible I hasten to add. I think any collection would need one of each! The Explorer has attracted me more and more the last few years, but I've never purchased one as 36mm was too small for my wrist. That changed with the release of the 39mm version, which in my mind kind of rebooted the Explorer ready for the current trend for larger watches, accepting that 39mm still isn't a large watch by others standards. I don't think the hands look too short at all, and hope to purchase one at some point in the near future. Agreed, also next on my shopping list. Can't see the problem with the minute hands on the 212470. A little shorter than its two predecessors - yes, but similar length as those on 1016 as far as I can see. I have an incoming 114270. Quite looking forward to it, it'll be my second one, the first was my fist Rolex many years ago. I a wearing much smaller watches these days and think it'll be nice to go back to such a classically proportioned watch. I went for the 114270 since I prefer the size and the proportions. Not just the hands, but the lugs/bracelet width to the case. The new one has increased the case size while keeping the lugs/bracelet at 20mm, which I'm not a fan of in comparison to the 36mm case and 20mm lugs/bracelet. Last edited by Rano85; 4th May 2015 at 10:25. Couldn't agree more. The perfect watch, now the perfect size! 114270 for me. Better bracelet than the 14270 with SEL and I hear a very very slightly improved movement, also tritium on many 14270 will start being dimmer now. Proportions just perfect, sounds small at 36mm but does wear very well indeed. Tried on the 39mm and it looked good but still preferred the 114270, wasn't a fan of the polished 3,6,9, felt the thin white inlay on the 114270 added a to the look. Good luck - none of these will disappoint I'm sure. We expect to see pictures when you get one :-). No substitute for trying them on tbh. 36mm is too small for me and the latest 39mm transformed the watch for me when I tried it. Top of my current (constantly changing) wish list. Hope to seek out a lovely 114270 one day. Absolute classic Rolex.